Please put your personalization, (either 2 initials and & or 3 initials), here before going to check out. (Note: If 3 Initials, the classic format is First Initial, LAST Initial, Middle Initial.) All letters will be same size. Heart Shaped Pottery Ring Dish for a Unique Personalized Gift for the Bride! 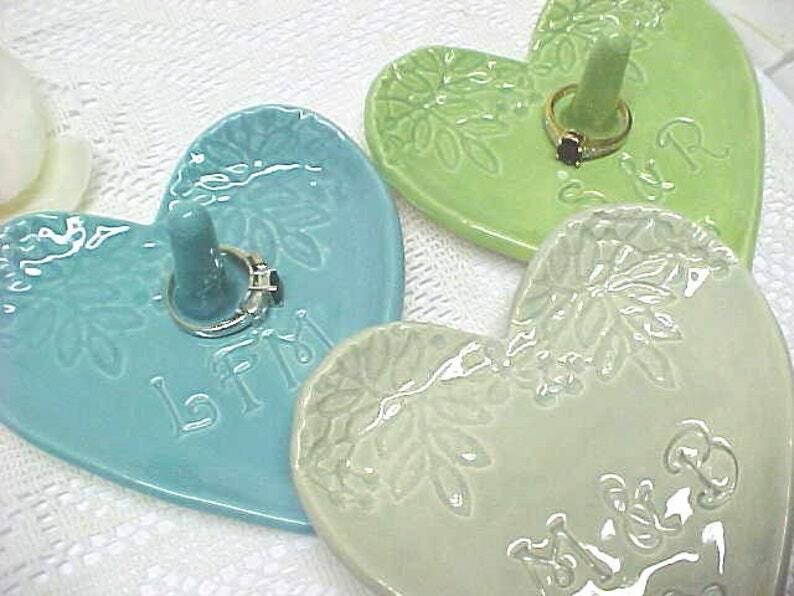 Lovely floral tendrils impressed into this clay ring holder make this a special design! Put initials in the box before going to checkout. I can add a Date, too! Set drop-down on your choice! NOTICE SIZE: Measures about 4 inches wide, about 4 inches from top to bottom. Nice, thin pottery, not heavy! I make this out of White Porcelain, craft it into a Heart Shaped dish & impress lovely lace tendrils design.